If you have your client’s trial balance information in a CSV file, you can import their initial trial balance to save you having to enter it manually. 2. Click .CSV template to download an example CSV file. This will help you have the information in the right columns. 3. Open the downloaded file. This should open in a spreadsheet program like Microsoft Excel. 4. You could complete this file with your client’s figures, or rearrange an existing spreadsheet you have so that the columns are in the order: Code, Name, Debits, Credits. You need to enter either a Code or Name. When saving the CSV file after making your changes, you must save it in CSV format. Depending on what spreadsheet program you’ve used to open the CSV file, when saving you may be prompted to save it in a different format. Disregard this advice and save in CSV format. 5. Click Upload > find your client’s CSV file > Open > Clear the checkbox next to any rows you don’t want to import > make any adjustments to values > Next. You’ll need to review these mappings and make any adjustments you feel are needed before confirming. 6. Review the list of mappings > Make any necessary changes > Save. 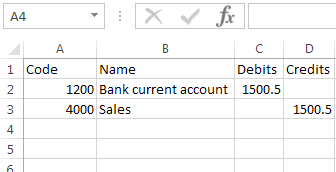 Repeat this step allocating the imported value to how many accounts are necessary. This can be a mixture of existing nominal accounts and newly created accounts. Repeat this until you’ve allocated all your account balances.